Don Paul: Is that about it for the snow? It wasn’t much snow, and with the higher angle of sun now, it won’t stick around long in exposed locations. But it will be enough for Buffalo to keep its lead in the Golden Snowball contest for the most cold-season snow (Buffalo 117.4 inches as of Sunday evening compared to Syracuse’s 111.1 inches). If you like that kind of historical data, this will be one of the few seasons in which we beat Syracuse, whose average snowfall is a fair amount higher than that of Buffalo. 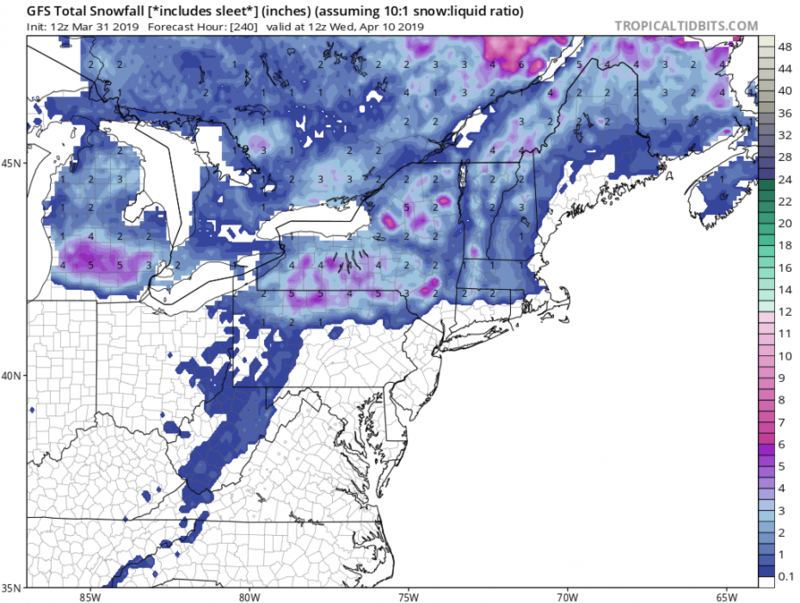 Snow in April isn’t rare in New York City or Boston, so it certainly isn’t rare in Western New York. 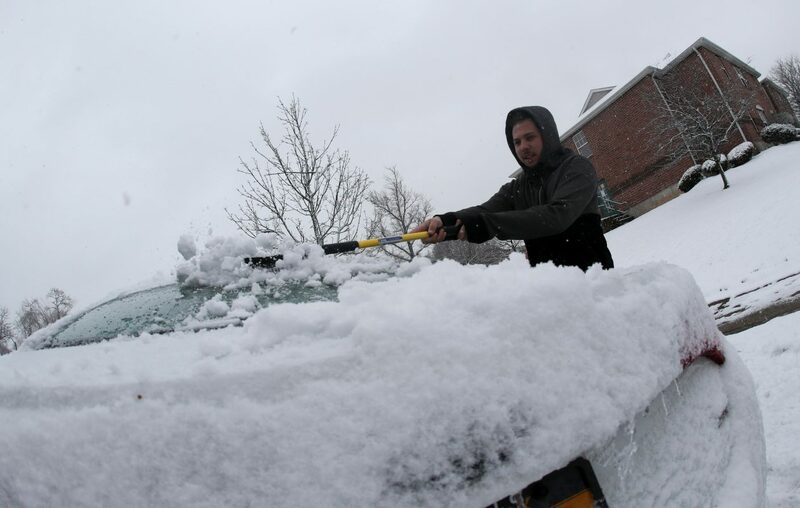 On average, Buffalo receives only minor amounts with monthly totals under 3 inches. However, there have been plenty of exceptions to that. A foot fell in April 1957; 13 inches fell in April 1961; and 15 inches fell in April 1975. In general, these higher totals have tailed off in the last three decades, though we did receive 7.1 inches in April 2016. Whether this trend is tied to a warming climate is a real possibility but still inconclusive. Extended range guidance suggests a decent turnaround from Sunday and Monday’s chill to readings a little above average beginning Tuesday. I do have to point out such ensemble means tend to be smoothed data, especially further out in time. You may notice little kinks in that flow across the country. Sometimes, those kinks amplify and become deeper as they draw nearer in time. In essence, that’s part of what happened to deliver measurable snow Sunday morning compared to what had been showing in the ensembles earlier last week. Each ensemble mean is the average of many runs of a given model. The members in the ensemble may actually become spread out over a wide range. Sometimes, the smoothed mean isn’t really representative of what finally occurs. This spread can be seen in what we call “spaghetti plots” in which the individual members in an ensemble can be seen. Notice how there is initially good agreement between all the members in this ensemble animation, but how the “spaghetti” really spreads out with time. 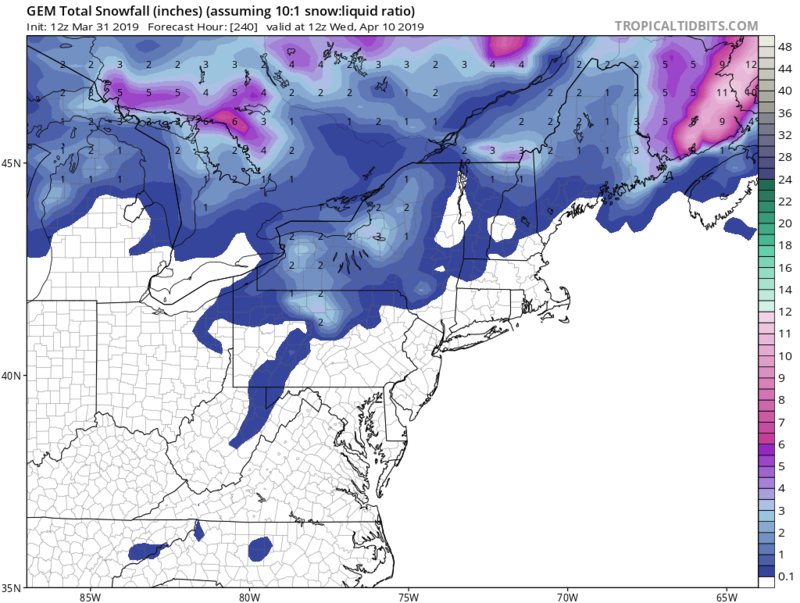 About the same in seen in the European/ECMWF model; little if any snow after Sunday night during the next 10 days. As for the upper air flow, those smoothed ensemble means are fairly optimistic for seasonably mild temperatures. 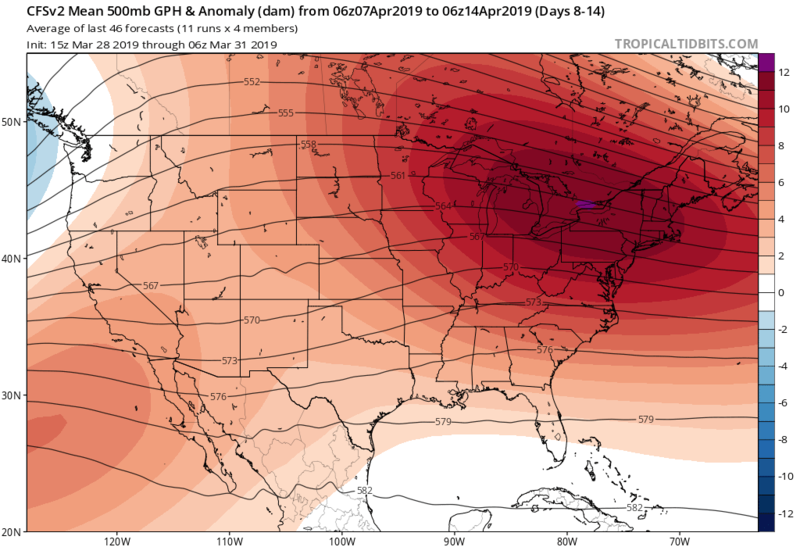 The ECMWF shows more warmth in the east around April 9. The GFS mean looks fairly mild even further out into mid-April. We are given a 55 percent probability of above-average temperatures in weeks three and four. By then, the average Buffalo high temperature runs from the mid-50s to closer to 60, so even average wouldn’t be bad compared to this colder-than-average March we’ve just endured. Do I think the CFSv2 is overdone? As someone used to say, “you betcha!” This model often has a warm bias. At least I’m not seeing any models or ensembles at this point that are unduly pessimistic. And as I finish, I’m viewing the slushy snow on our front walk pulling a slow disappearing act. The crusty shovel stays put.